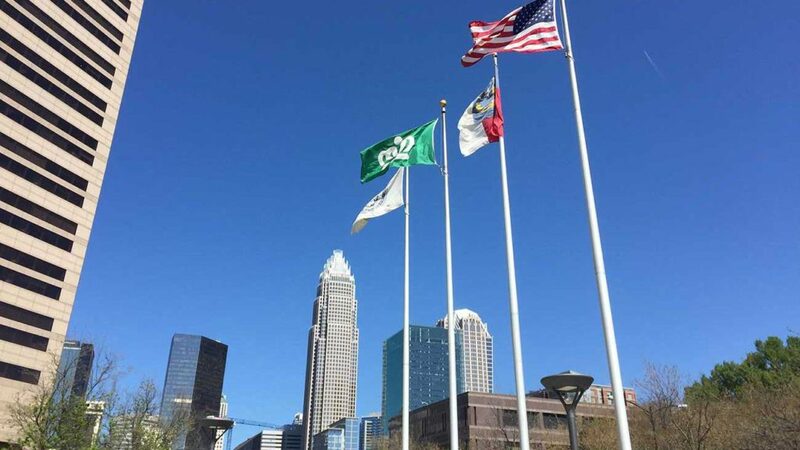 This is my #1 favorite cocktail in Charlotte (hence its prominent spot on my list). 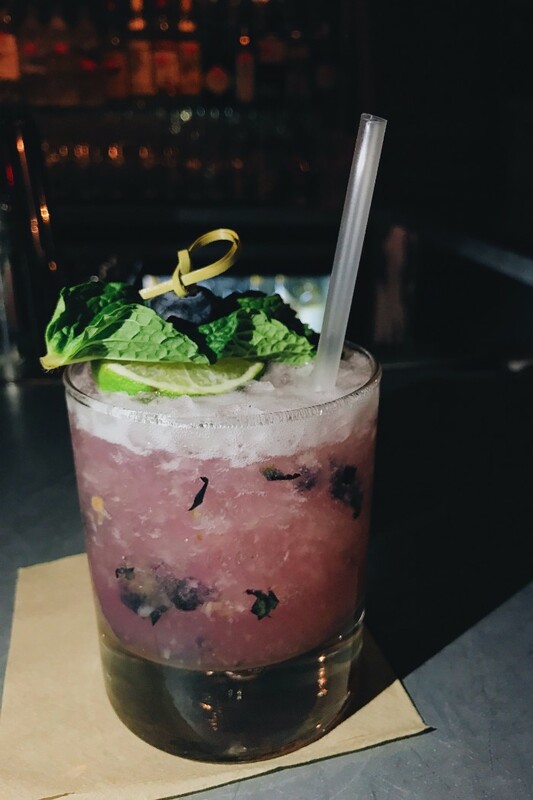 It’s Tito’s vodka, fresh squeezed lemon and lime sour, muddled blueberries and a generous mound of crushed ice. I think it’s the ice that does it for me. Here’s the cocktail you turn to when you want to make a big dramatic show out of your drink order because, you know, it’s on fire. 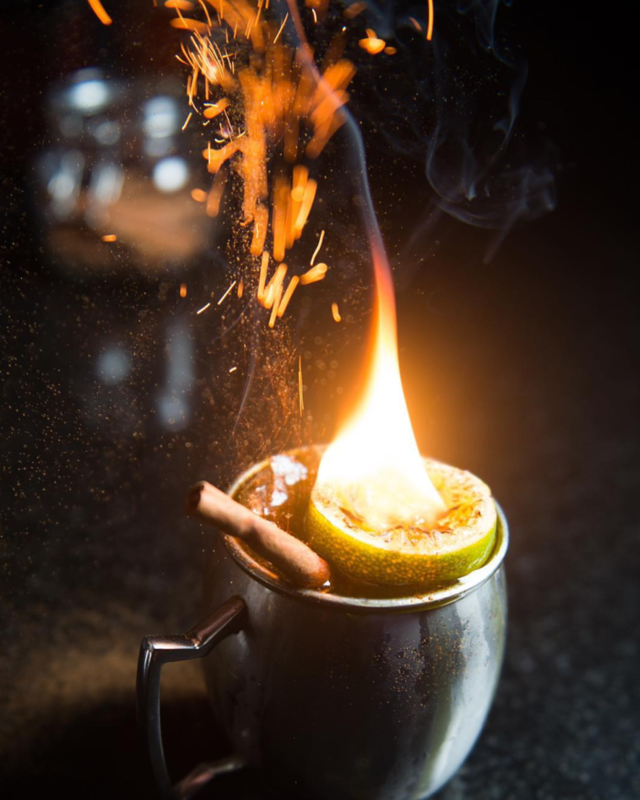 It’s Canadian apple whisky, agave simple syrup, lime juice and ginger beer garnished with a flaming lime. 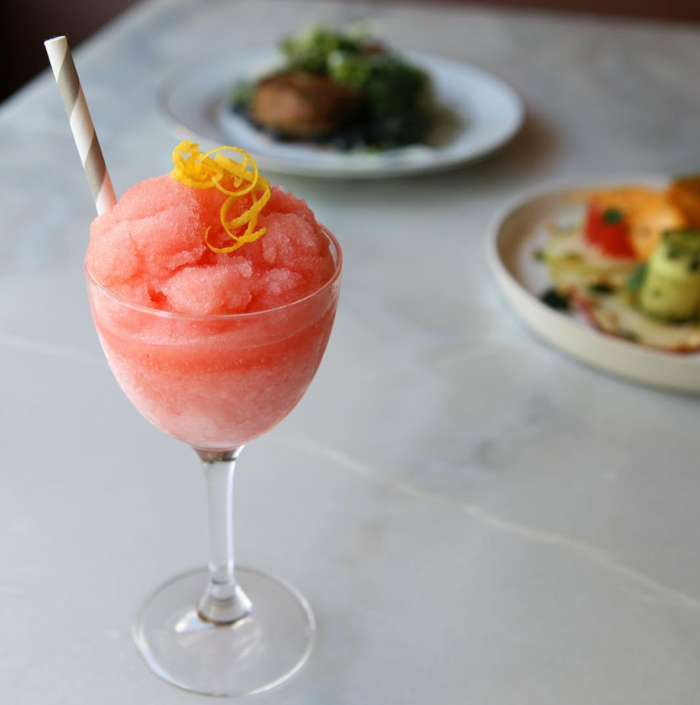 Frozen rosé was the drink of the summer last year and Kindred nailed the trend with this seasonal lemon frosé — a simple blend of rosé wine, lemon zest and lemon juice. Kind of like a grown-up frozen pink lemonade. Can’t forget my bourbon drinkers. Here’s a twist on the classic Old Fashioned with Bulleit bourbon, muddled oranges, Cointreau, Carpano Antica vermouth, aromatic bitters and agave. 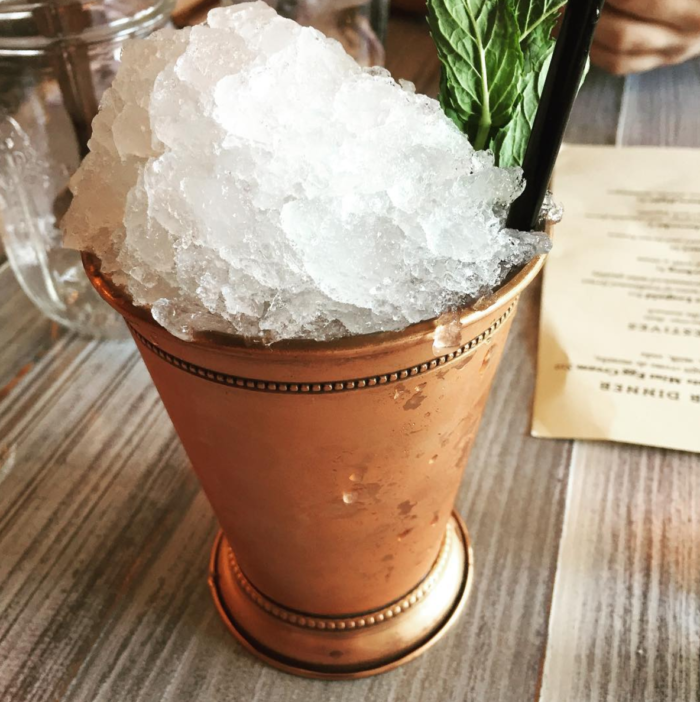 Haberdish’s gorgeous floral cocktails featuring frozen spheres of flowers and herbs are getting a lot of social media love right now, but don’t let that distract you from their classic house mint julep. 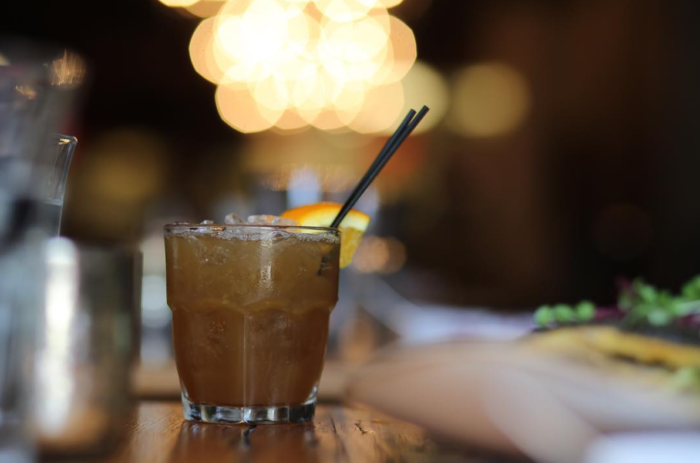 You know the drill: bourbon, mint, simple syrup and a mountain of flaked ice served in a traditional copper cup. It’s a build-your-own cocktail of sorts. Pick your favorite King of Pops popsicle (rotating flavors) and then pair it with your choice of bubbles — cava, prosecco, brut or rosé. 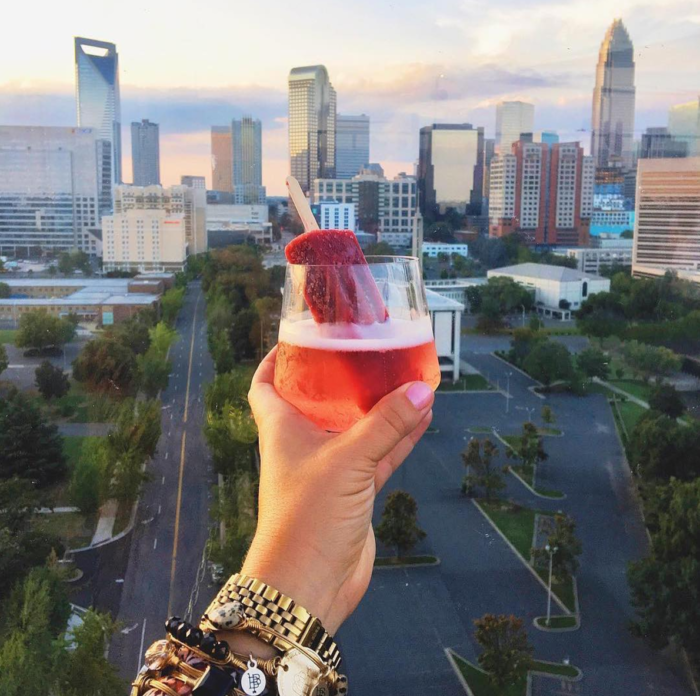 Possibly the most Instagrammed drink in all of Charlotte. 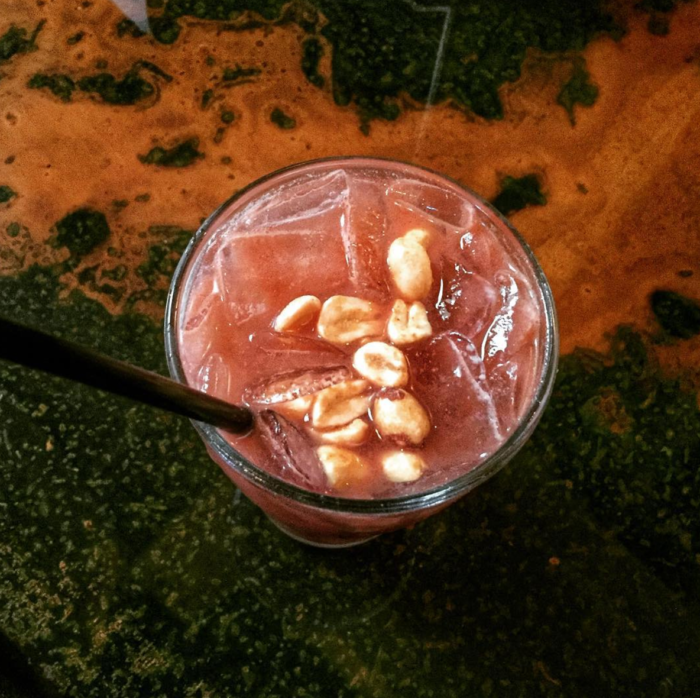 You won’t find any neon green sour mix at this Mexican restaurant. They make their own mixers with fresh squeezed citrus juice, and their shaved ice cocktails are what summertime drink dreams are made of. 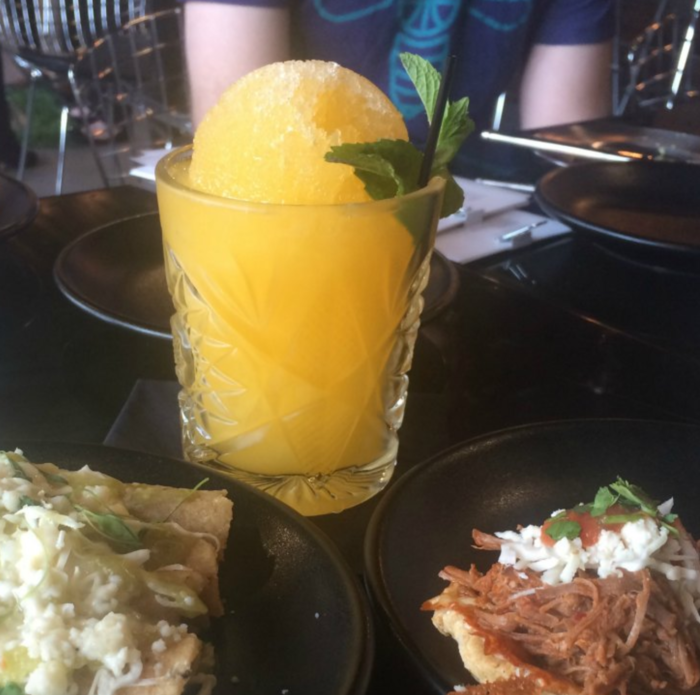 The Machete is made with Vida Mescal, Patrón Citronage, fresh tangerine juice, mint and shaved ice. The Cotton Room is about as hole in the wall as it gets in Uptown. You’ll find the cozy little cocktail bar upstairs at Belfast Mill in the Brevard Court alley. 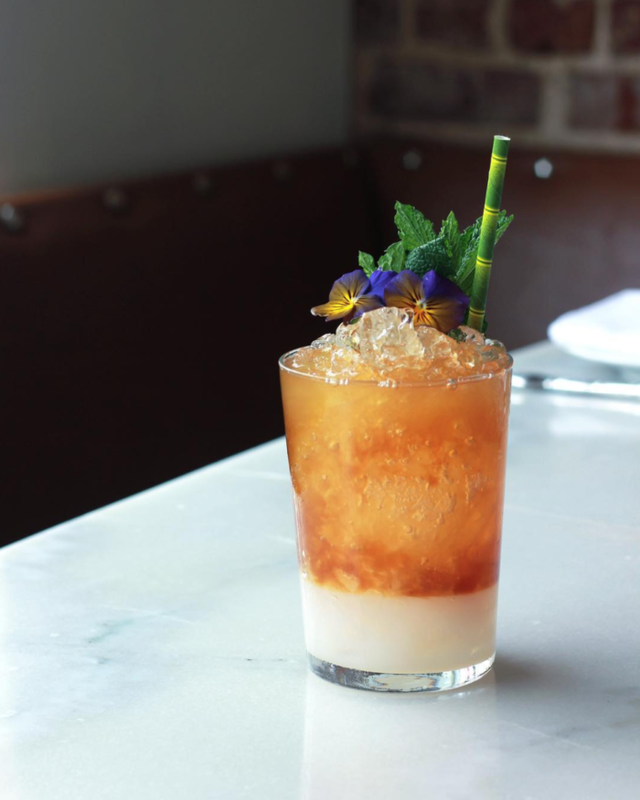 They regularly flip their menu to feature new drinks and this unique southern-inspired cocktail with bourbon, peanut orgeat, Cheerwine and a roasted peanut garnish didn’t make the most recent cut. Don’t fret. They tell me it may be back in the spring/summer. You better come hungry to drink because thing is serious. 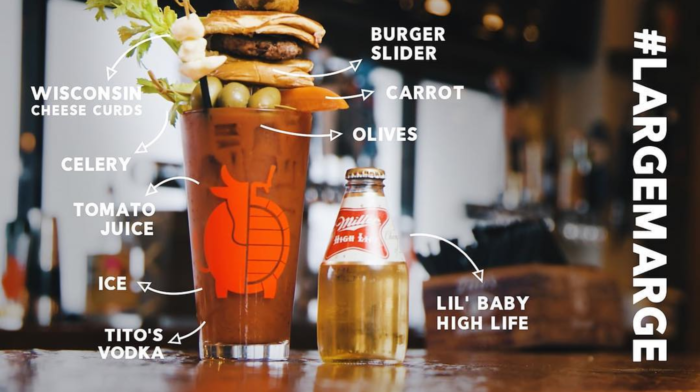 It’s a 20-ounce Bloody Mary with two shots of Tito’s topped with a jalapeño firecracker, Wisconsin cheese curds, two grilled cheese sandwiches (two! ), an angus burger slider, fried green tomatoes, applewood smoked bacon and a mini Miller High Life on the side. Soju at Seoul Food Meat Co.
Soju is a popular clear Korean liquor usually served neat. But at Seoul Food you can get it served in a show-stopping pineapple, melon or coconut. It’s one of those drinks that makes everyone else in the restaurant crane their necks and ask their server what it is. 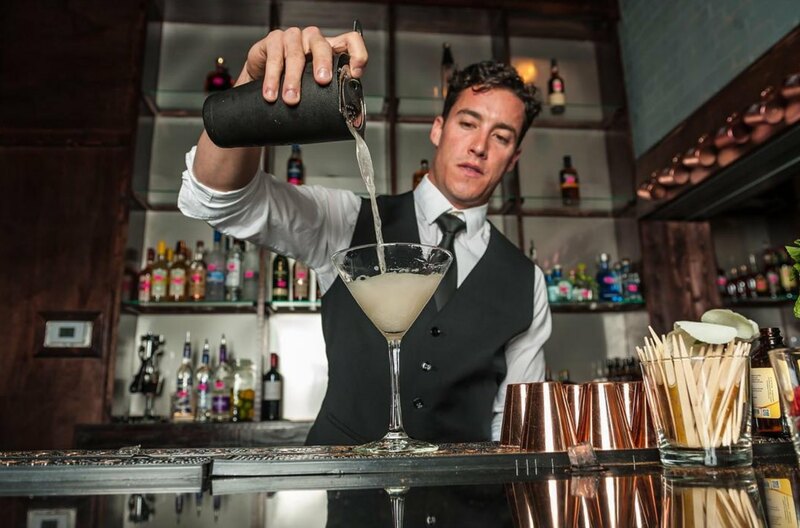 And one to watch… Tiki cocktails at Hello, Sailor. The second restaurant concept from Joe and Katy Kindred will debut on Lake Norman later this year. 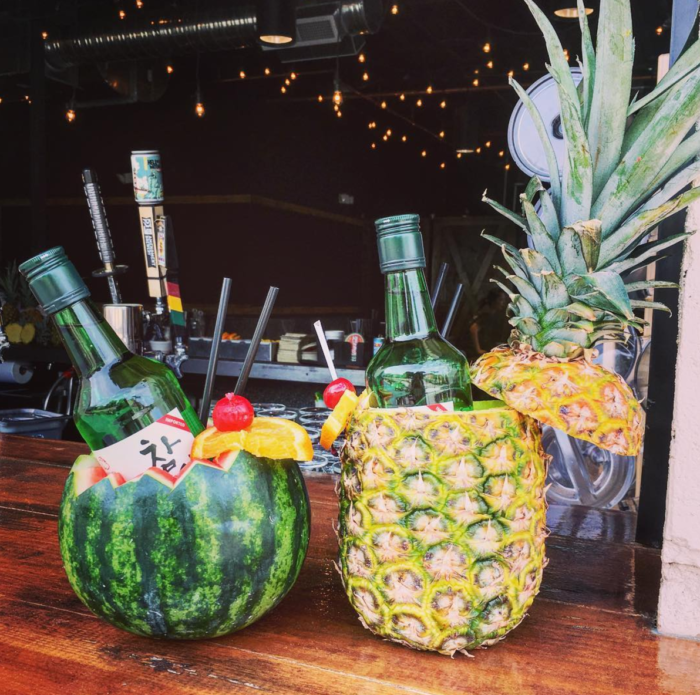 In the meantime, they’re testing tiki-inspired cocktails at their original namesake restaurant in Davidson. This one is Pusser’s Rum, tangerine, pineapple, orgeat and averna. Please drown me in it.